Ah, the days of yesteryear when poker players had to stand in line for an hour or more to enter cash games at their favorite card room. Remember that? Or how about those times you headed out to Las Vegas and had to ask around for the best games and tournament schedules? With so much real-time technology available at our fingertips these days, it only seems logical that the creation of cutting-edge live poker apps would be next, and that is precisely what is now available. Take the AllVegasPoker application for mobile devices. 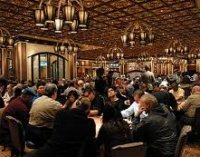 If you've ever gone to AllVegasPoker.com, then you know the site’s staff does its best to keep up with the latest tournament start times at Las Vegas casinos. It also provides a bevy of other information such as telephone numbers and reviews. Now, you can get all that information and more on your mobile device. The AllVegasPoker app has a clean display feature that shows a Las Vegas casino, provides an interactive map on how to arrive at your destination, and gives you pictures of the card room's interior. What's more, the app has user reviews so you can check out what your poker colleagues have to say about buying into certain games and how the service is. Other information you'll get includes tournament schedules, buy-ins, game types, and days available. You can even get a rundown of which major poker series are on tap at your favorite casino, all from your phone. Customizable search options allow users to look for tournaments and games that take place at a certain time at a specific buy-in level. Then, you can view which casinos have those events available. If you'd like to call ahead, simply touch the screen and dial directly to the card room to reserve a seat, talk to the manager, or inquire about poker room rates. The AllVegasPoker app is currently only available on the iPhone, but a version that is compatible with the Android is in the works. BravoPokerLive is another mobile phone application that gives unprecedented real-time information to users when it comes to finding their favorite games. This app focuses on real-time updates of cash game action and can ping the user when his or her seat opens up. The app provides detailed information about tournament buy-ins, starting chips, and schedules. When it comes to cash games, this application can let you know how many tables are currently in progress due to its direct link with casinos. In some cases, a “Seat Available” icon will appear as soon as someone has removed his or her chip tray from the table in question to let you know a space has opened up. The BravoPokerLive application is available on the iPhone and the Android. These applications are perfect for both long-time residents of Las Vegas and tourists who are looking to cash in on all of the action. You can practically arrive at Las Vegas early in the morning, in the afternoon, or in the wee hours of the night and find a poker game to participate in within seconds. Remove the search from your live poker experience by downloading the AllVegasPoker or BravoPokerLive apps onto your iPhone today and have the latest live poker action news from Las Vegas available at the touch of your handheld screen. What's best, both applications are available for free for immediate download. AVP already released their Android App! Looks very similar to their iphone app and works perfectly!